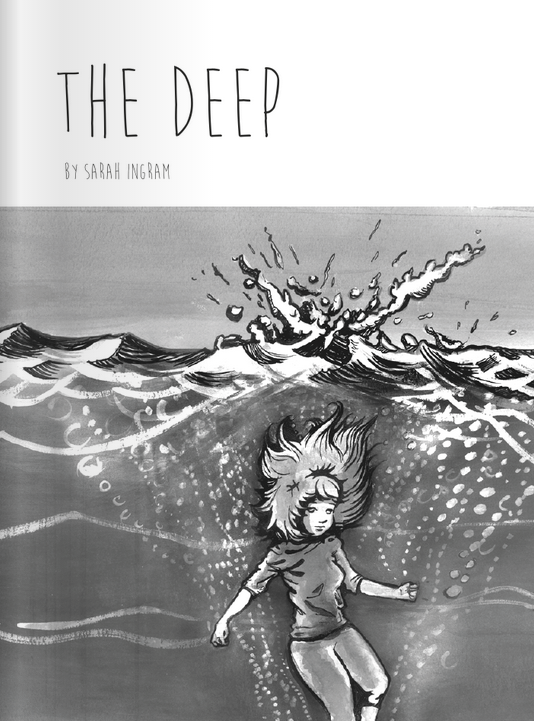 Part graphic narrative and part pure sequential art, Sarah Ingram’s The Deep utilises potent visual metaphor to immerse the reader in the world view of a teenage girl suffering from depression. Ingram acknowledges a debt to Sylvia Plath’s poem ‘Elm’ as way of introduction to this short 25-page minicomic but the true power of the book’s narrative lies in the synthesis of stark and affecting imagery with raw yet succinct prose to forge a profound emotional connection between audience and creator. The second paragraph in any of my Broken Frontier reviews is usually the point at which I give a concise summary of plot, characters and thematic focus. In this particular case, though, I can only really tackle that third element because The Deep is an entirely representational piece of storytelling. 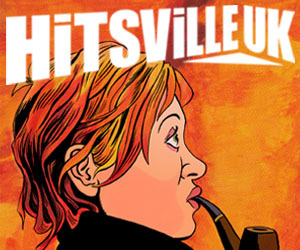 It’s clearly written from an autobio perspective but this isn’t an obvious example of slice-of-life graphic medicine. 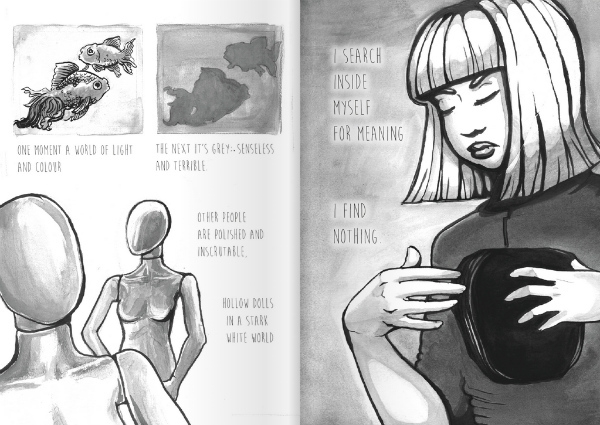 It’s about recreating something intensely personal – living with depressive illness – on the comics page and communicating a resonant impression of a prevalent and still too often stigmatised condition that many of us will experience in our lifetimes. 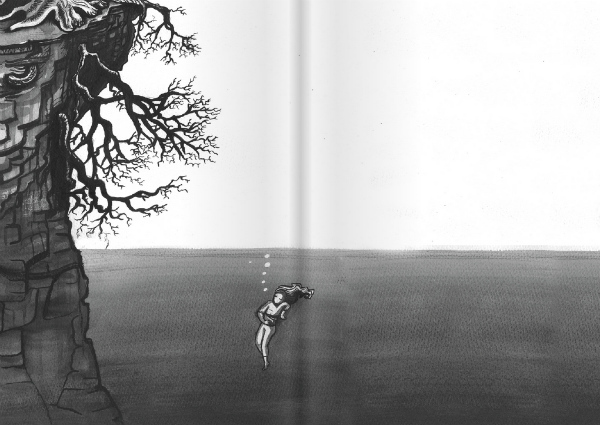 The Deep of the title signifies the comic’s main extended metaphor as protagonist sinks into a watery abyss. It’s a sequence that encapsulates helplessness, capitulation and pain but also acceptance, pragmatism and tentative triumph. Ingram’s art has a tender beauty here – delicately haunting in pacing and delivery. Ingram evokes the sense of detachment that depression can bring with a compelling symbolic intent. Some of the visual devices she uses may be obvious choices in presentation – claustrophobic entrapment, colour draining from the world, gaping voids – but they are no less effective for that, and there are distinctive, unforgettable scenes where she relates a sense of disengagement with the external world with a truly memorable candour. The page below with its line “Hollow dolls in a stark white world” as her on-page persona withdraws further into herself has stayed with me long after my initial reading. The Deep is available as a physical product but, vitally, it is also available to download for free online. 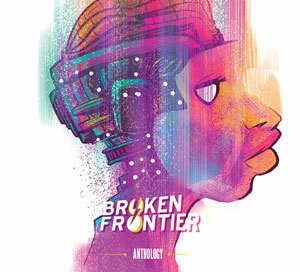 I have said much about the importance of graphic medicine as a tool for educating and sharing experience in an accessible and easily digestible manner in both this column and my other writing work at Broken Frontier over the years. The Deep is an excellent example of this strand of comics at its most effective and empathic. Another name in UK comics self-publishing that may be new to many readers but one that I hope we have not heard the last of because this is a most impressive debut use of the form. For more on the work of Sarah Ingram visit her site here and follow her on Twitter here. 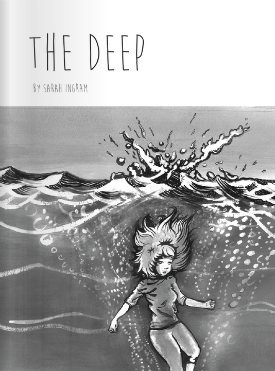 You can read The Deep here for free online and the comic is also available in a print version here priced £4.50.